The staff at Eckington Court provide care for the residents… whilst the residents provide care for the local wildlife! Eckington Court are taking part in RSPB’s Big Garden Birdwatch 2019. The Birdwatch invites people to watch and write down all of the different birds that visit their garden, all of the data is collected and put together in order to tell how the local wildlife is doing! 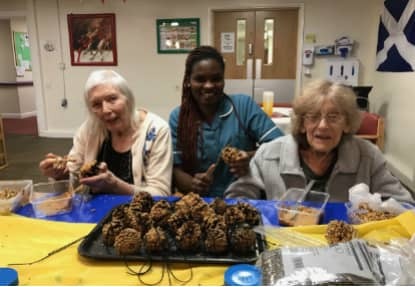 In order to attract and care for the local wildlife so that residents can get a good look at their feathered friends, the home set out at making their own bird feeders. These homemade bird feeders are made using pinecones, peanut butter and bird seeds. “It’s sticky but it’s fun! They’re bound to bring flocks of birds”, commented Sheila, one of the residents at Eckington Court. With Eckington Courts large and enclosed garden, all kinds of wildlife are sure to come sniffing around for some food!